Evrika Hotel (ex. 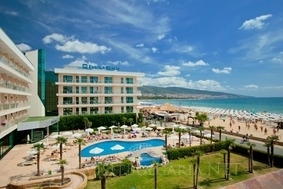 RIU Evrika) in Sunny Beach Resort, on the Black Sea in Bulgaria. * Shower room with w.c.
* New! This summer the guests of Club Hotel Evrika Beach will be pleased to find new Water Park as a part of the All Inclusive program with a great selection of attractions for all ages.